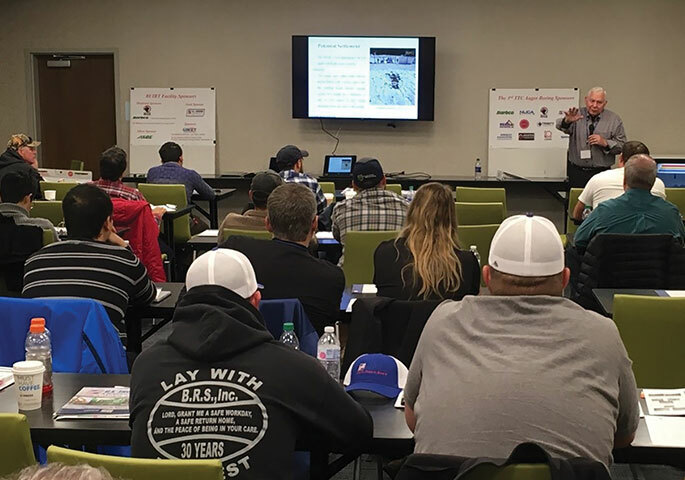 Louisiana Tech University’s Trenchless Technology Center (TTC) and the National Utility Contractors Association (NUCA) teamed up to offer the third Auger Boring School (ABS) Nov. 12-16, 2018, to meet the high demand for engineers and contractors trained in auger boring design, application and installation. The five-day, intensive course included classroom lectures and practical sessions covering all aspects of auger boring projects from design to construction with special focus on safety, instructed by the foremost experts in the country. This ABS also celebrated the first TTC Lifetime Achievement Award, established to honor exemplary leadership in and contributions to the trenchless industry. Recipients were brothers Leo and Jim Barbera. Founding American Augers in 1970, Leo secured many patents for safety and productivity innovations, such as the first rack-and-pinion HDD rig in the U.S. He was also on the original TTC Industry Advisory Board, in 1991. His brother Jim also gained extraordinary experience working at American Augers. When Leo sold the company in the late 1980s, Jim applied all the knowledge and experience gained from working at American Augers to start Barbco Inc. in 1989. An international manufacturer of auger boring machines, directional drills and advanced tunneling equipment, Barbco has continued the tradition of innovation and high quality in creating custom equipment to fit project needs, and make contractors more efficient and safer. Presenting the award were Tom Iselsy, Ph.D., professor of Civil Engineering at Louisiana Tech and TTC’s associate director of International Operations; and Les Guice, Ph.D., who was department head of Civil Engineering in 1988 when he hired Iseley and assisted with the establishment of TTC, and currently is president of Louisiana Tech University. Sponsors of the third ABS included Barbco, U.S. Shoring & Equipment Co., Baroid Industrial Drilling Products, Brierley Associates, Midwest Mole, Trinity Products, Logan Clay Products, Wicker Construction, IDS GeoRadar and Huxted Tunneling.